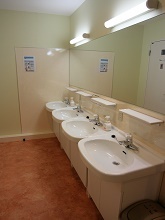 ■Men’s toilets, women’s toilets and unisex toilets are exhaustively complete. - Shower toilets (heated toilet seats with selectable warm shower/bidet functions) are provided. ・All rooms are Private room. ・All rooms can be locked from inside. ・All rooms are equipped with air-conditioner. ・We do not provide any meals. 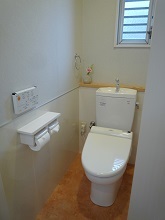 ・These bath/shower rooms, lavatories and washrooms are shared with other guests. 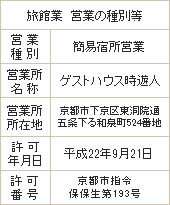 In Kyoto city, an accomodation tax regulation will be enforced starting October 1, 2018. The accomodation tax (200 yen per person/per night) will be imposed to your stay from October 1, 2018. The accomodation tax not included in room rate. Reservation longer than 5 nights via website or telephone would be given a discount. 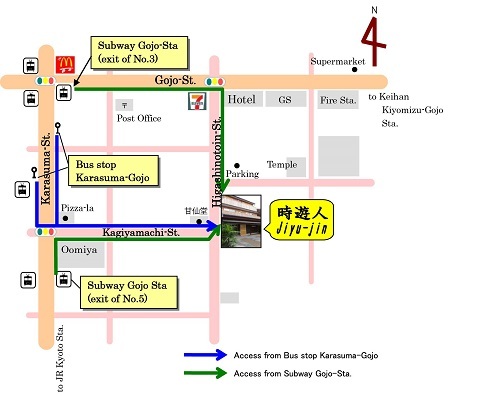 Nearest station is Kyoto subway Karasuma Line [Gojo station (五条)]. *We do not have a car park for guests. When you come by car, please use a toll car park near Guest house. The entire guesthouse could be reserved, depending on the purpose of your visit. ※We do not provide any meals. + Accomodation tax (200 yen per person/per night) from October 1, 2018. 120cm three-quarter beds (semi-double beds) are placed in both sides of the room. *Offer one-time complimentary bath towel. A lamp and wall sockets are equipped in each bed. • 반드시 위의 시간내에 와주시기 바랍니다. * 위의 시간 이외는 현관을 잠그고 직원이 부재중입니다. ◆체크인 전, 체크 아웃 후에 짐을 맡길 수 있습니다. -체크인 전에 짐을 보관할 수 있습니다. 이 경우에는 당일 오전 8 : 00〜11 : 00 사이에 와주십시오. 이 경우에는 16 : 00〜21 : 00 사이에 수령을 부탁 드립니다. ◆Wi-Fi를 무료로 이용하실 수 있습니다. ◆각 룸 키는 자동잠금 시스템입니다. ◆각 객실에 에어컨 시설을 갖추고 있습니다. 목욕탕, 샤워실, 화장실 등은 공용입니다. 예약 양식의 항목은 정확하게 기입하십시오. 결함이 있는 경우, 예약을 하실 수 없습니다. ■예약은 숙박 희망일 4 개월 전부터 가능합니다. ■중학생 미만의 숙박은 삼가 하고 있습니다. ■게스트 하우스 이므로 객실과 외부의 소리 등이 들리기 쉽습니다. 이점 미리 숙지 하신 후 예약 바랍니다. ■예약완료 후, 지유진(게스트하우스) 에서 보낸 메일에 기재되어 있는 주의사항을 반드시 읽어주십시오. 위의 사항을 숙지 하신 후 예약신청을 해 주시기 바랍니다. Please ask the front desk for bed sheets exchange. ■Internet is available 24 hours in the common room. ■All guest rooms are equipped with LAN internet access so that you can connect your own computer. You can rent bicycle in here. When you use a bicycle, you can go anywhere in Kyoto city !! ■Please ask the front desk for bicycle rental (with 3 speeds). ■It is on a first-come-first-served basis since the bicycle is limited in quantity. We can temporarily keep your luggage for free before check-in and after check-out. -Before check-in, please bring your luggage between 8:00 and 11:00. -After check-out, please pick up your luggage between 16:00 and 21:00. ※If you would like to leave the luggage between 11:00 and 16:00 (Closed time), there are coin-lockers in the Kyoto station. We recommend to use the coin-lockers at Kyoto Station. 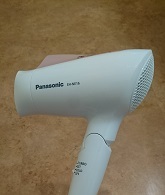 ■Free hair driers are supplied in front of the common room (lounge). ■The following amenities are available for sale. ■The following amenitie is available for rental. 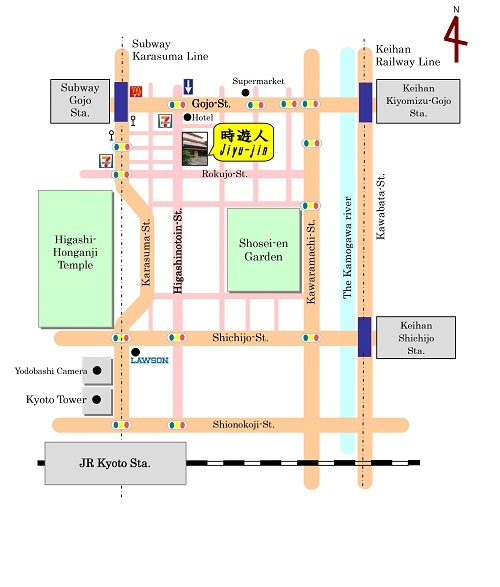 Kyoto subway Karasuma Line [Gojo station (五条)] is the nearest station. ・Once you check-in, you can come back anytime you want (no curfew). *The entrance door will be locked, and staff are absent “from 11:00 to 16:00” and "from 21:00 to 8:00”. ・You can also check-out before 8:00 am. If you wish to depart early, please let us know about it in advance. ◆We can keep your luggage for free before check-in and after check-out. ◆Each room can be locked from inside. The room doors lock Automatically. ◆Each room has an air conditioner. ◆The bath and shower rooms are available 24 hours (except during cleaning time). *These bath/shower rooms, lavatories and washrooms are shared with other guests. ■You can make a reservation up to 4 months prior to your stay. ■Payment should be made on the day of your arrival. ・Please pay the total amount at one time. ■We do not accept credit cards/debit cards. Please make sure to exchange some currency into Japanese yen. ■Inside of guest house has a strict non-smoking policy. Please smoke at the smoking area in the balcony of second floor. ■Twin rooms have double-deck beds (not parallel). ■Standard Twin Room have parallel beds. ■We do not accept guests under 13 years of age (Junior high school). ■You can reserve for up to 6 people per group. ■Please be considerate of others and try to keep noise levels down, especially after 22:00. Also, please understand that it is not a hotel. It is a guest house. Therefore, please excuse excess noise. ■Please be sure to check all the content of our emails. Thank you for your time and choosing our guest house. 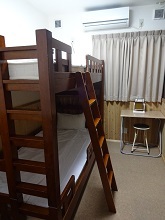 It is a room shared with other guests.We have male-only and female-only dormitories. Towels,bath towels,tooth brushes,pajamas,medicine are not included in the room. Hand towels and tooth brushes are available for sale. Bath towels are available for rental. Can you keep my luggage before check-in and arter check-out? Before check-in,please bring your luggage between 8:00 and 11:00. After check-out,please pick up your luggage between 16:00 and 21:00. No. Please pay the full amount in cash at the time of check-in. There is no parking space at our facility. If you are arriving by car, please use a nearby coin-operated parking lot. Is smoking allowed inside the building? No. Smoking is not allowed inside of the building. Smoking is only permitted at the balcony on the 2nd floor. Yes. 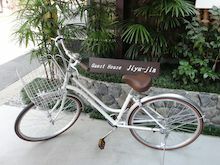 Bicycle rental is available for 500 yen/day. Internet is available 24 hours in the public room. Also, all guest rooms are equipped with LAN internet access, so you can connect your own computer. Please ask the front desk for cable. Does the room come with bathroom and toilet? No. Toilet, shower room, bath-tub and washroom are shared with other guests. There is a public bath (SENTO) in the neighborhood. All rooms are equipped with air-conditioner. Yes. Guests are free to use the refrigerator, rice cooker, toaster, micro-wave oven, electric kettle, electromagnetic cooker, dishes and seasonings. We have bath towels available for rental (150 yen/each). We have hand towels available for sale (100 yen/each). Seven-Eleven (open 24 hours) is 1-minute walk away. Do you have sightseeing attractions nearby? There is the Nishi Honganji Temple (World Heritage), Higashi Honganji Temple, Shosei-en Garden and Kyoto Tower within 15-minute walk. What is your cancellation/change policy? Please be aware that applicable cancellation/change fee will be charged starting7 days prior to your arrival. No. Pets are not allowed in our facility. You can make a reservation from 4 months before of the day of your stay. Availability page has a time lag, Sometimes the page is not accurate. Please contact us as soon as possible if you wish to cancel or change your reservation. Please be aware that applicable cancellation/change fee will be charged starting 7 days prior to your arrival. Below is the cancellation and change fee. Please email us with the information below if you don’t hear from us within 3 days or cannot send reservation form. *Please write your name in English as written on your passport. *Please write your home address in English as it is written on official documents. This is a necessary information to proceed your reservation. -Check-in time is from 16:00 to 21:00. The entrance door will be locked, and STAFF are absent “from 11:00 to 16:00 and from 21:00 to 8:00”. -We can keep your luggage prior to your check-in. In that case please bring your luggage between 8:00 to 11:00 on the day of your arrival. -체크인은 16 : 00 〜 21 : 00 사이에 부탁 드립니다. 11 : 00 〜 16 : 00 및 21 : 00 〜 8 : 00 에는 현관을 잠그고 직원이 부재중입니다. -체크인 전에 짐을 보관 할 수 있습니다. 이 경우에는 당일 오전 8 : 00 〜 11 : 00 사이에 와주십시오. ■Please review the contents of our email and reply to us within 3 days. ■Reservation will be complete when we receive a reply from you. ■Then we will send you an email titled【Reservation Complete】to confirm your reservation. ■Your tentative reservation may be cancelled if we don’t hear from you within 3 days. ■We will contact you within 2 days after receiving your reservation request to verify the information. ■If no rooms are available, we will also notify you within 2 days. ■Please contact us if you don’t hear from us within 3 days. ■Please contact us in advance if you wish to cancel or change your reservation request. ■To reserve, please go to 「Reservation Form」. ■You can reserve 4 month prior to your arrival. ■You can reserve up to 14 days（2 weeks）. ■Guests under 13 years old (junior high school student) are not accepted in all rooms. ■We accept reservations for maximum 6 persons per group. *Multiple reservations from the same group would be considered as a single group reservation. Reservations must be from the persons who would stay at the guesthouse. *Reservations through third person/agency are not acceptable. Please provide detailed information on the reservation form. *We might ask the names of all the guests in order to avoid misunderstandings and unnecessary troubles. In Kyoto city, an accomodation tax regulation will be enforced starting October 1, 2018. The accomodation tax (200 yen per person/per night) will be imposed to your stay from October 1, 2018. ■Check 「Room availability」and follow the instructions below. ■Please be aware that room availability fluctuates constantly, so it may be possible that no rooms are available even though the date shows 「Available」. ■Washing machine and dryer are subject to fees. ■Dry laundry on the balcony available. ■Having a self-catering kitchen for your use. ■Guests are free to use..
■Bathroom and shower booths are available 24 hours a day. *Note that it is not available during cleaning time. *Note that you need to wait for using shower facilities, at a peak period, etc. 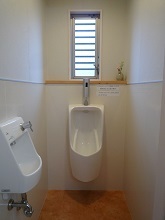 ・One bathroom with a bathtub is provided. - It is a common bath for family use. - You can lie in nice bathtub filled with warm water. ・Shower booths are respectively separated for male and female. *The 2 in 1 shampoo and conditioner, body soap, or cleansing foam and make-up remover (only for female shower booth) are exhaustively complete. ■This is a space to meet and interact with other guests, or to just relax yourself. ■Please make a good use of free internet service and travel guides. ■Offering coffee and tea (black tea/green tea) for free. *Futon (Japanese style-bedding) used in TATAMI room. Nice and bright south-facing room. Desk lamp and wall socket are equipped in each room. *It is not real traditional Japanese room (Machiya). *You might feel the room is a bit small or narrow. 208 cm long bed, much longer than regular single-size bed. 120 cm three-quarter bed (semi-double bed).